We started off the year with a road trip to Picton – having a squiz at Kaikoura, Picton and points in between. Lovely family catch ups and discoveries on a whirlwind trip. 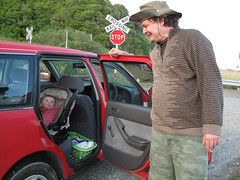 Scorchingly hot weather to be driving in, but the open road beckoned and baby slept well on the way there and back and we all enjoyed the creme de la creme of music – 2009’s finest, Tom Middleton, Tosca, Florence and the Machine, and loads more. Wilkommen 2010 and hope y’all have a great year.